Getting used to your first set of dentures can be an interesting experience. There are a lot of extra care instructions to ensure that your new dentures last a long time and gives you all the advantages they are supposed to. Even though you can use them as teeth, they are not as robust and durable as teeth. They can't afford to be dropped or mishandled as they may crack. One of the best pieces of advice we can give you about how to handle a set of dentures is - always handle your dentures over a folded towel or a sink full of water. If you drop them while brushing them it won't mean a long drop to the hard floor. This can save your dentures. Make sure to keep them nice and clean, but please, don't use toothpaste to clean them! Toothpaste is designed to take care of real teeth with enamel covering them. Toothpaste can microscopically damage a set of dentures and cause them to have a much shorter lifespan. Just like with real teeth, you will want to brush your dentures with a soft bristled toothbrush to avoid unwanted wear and tear. When you do brush them, you will want to brush all the surfaces, not just the part that looks like teeth. By brushing them you are ensuring that plaque doesn't build up on them, the same as real teeth. Denture cleaning products are usually found right next to the toothpaste and floss in the dental care aisle of the supermarket. Because dentures must be removed at night, it's important to find a good denture solution to store them in. Denture solutions can rid them of unwanted smells and help in the fight against bacteria. 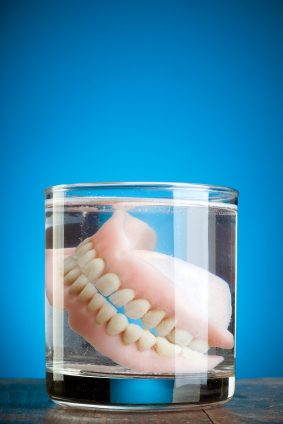 Most dentures can be safely stored in water as well. Call our office today at (928) 277-0076 to schedule your appointment!